Are you ready to accelerate product/market fit? 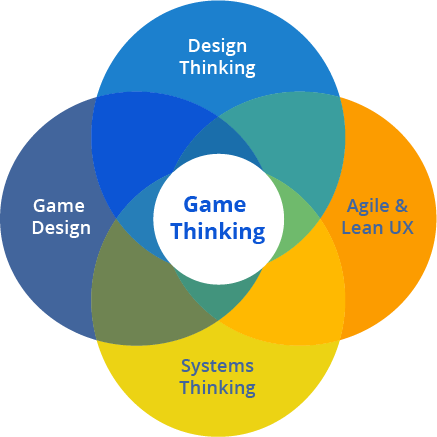 Game Thinking is a proven system for building lasting engagement into your innovative product – based on design techniques from hit games. Get your hands on this powerful book and start innovating smarter today. Get your hands on proven tools and techniques that will increase your odds of success! Our 2019 Game Thinking Masterclass is launching soon – get on the early-bird list to be first in line when the doors open. Game thinking embraces the principles of lean/agile design and design thinking: empathize with customers and move rapidly through the build-test-learn cycle. But what about engagement? How do we keep customers coming back? The games industry knows how to make deeply engaging products. By working on genre-defining games like The Sims, Rock Band, and Ultima Online, Game Thinking pioneer Amy Jo Kim learned that customers stick with products that help them get better at something they care about. She now uses Game Thinking to help companies like Netflix, Disney, The New York Times, Ubisoft and Happify deepen long-term engagement. Step by step, we’ve helped thousands of teams and entrepreneurs apply Game Thinking to their projects and get great results through our online Team Accelerator, Masterclass, and custom Workshops. Next Masterclass starts Oct 1. Leading companies like Disney, Electronic Arts, Ubisoft, Netflix, and the New York Times have used Game Thinking to design mission-critical products & games – and now you can too. Stop wondering if you’re doing it right; instead, use Game Thinking to zero in on the right early customers, and design a product that’ll keep them coming back, again and again.